No surprises on how the Annual competition is shaping up after only one round but watch out in February for the first timers and the ten who haven’t participated for over three months as these all have a good chance of bagging big points next month. In the Parkrun world Bracknell took centre stage this weekend as Saturday saw many members practice their splits ahead of the Club providing pacers at the event on Saturday 27th January. There has been a huge number of members offering to get involved so we’ll be pacing times from 22 minutes to 44 minutes. It’s not too late to get involved and everybody is looking forward to a great run when the SJ masses descend on Great Hollands. Sunday at Bracknell saw their inaugural Junior Parkrun as 155 4-14 year olds completed three laps around the main field with a dash of mud and a woodland trail finale. A number of members’ children enjoyed their runs at the event. This is a great addition for any members with young runners as previously the nearest junior events were at Woodley and Guildford. Bracknell Junior Parkrun will be held every Sunday morning with a 9am start time as per the Saturday ‘parent’ event and covering a total distance of 2km. Back to Saturday’s Bracknell Parkrun where nineteen members took to the twisting Great Hollands course. There was some mud on the main field but the course mainly coped well with recent wet conditions. Catherine Barnes bagged a PB in 33:19 which is a cracking run in less than ideal conditions! 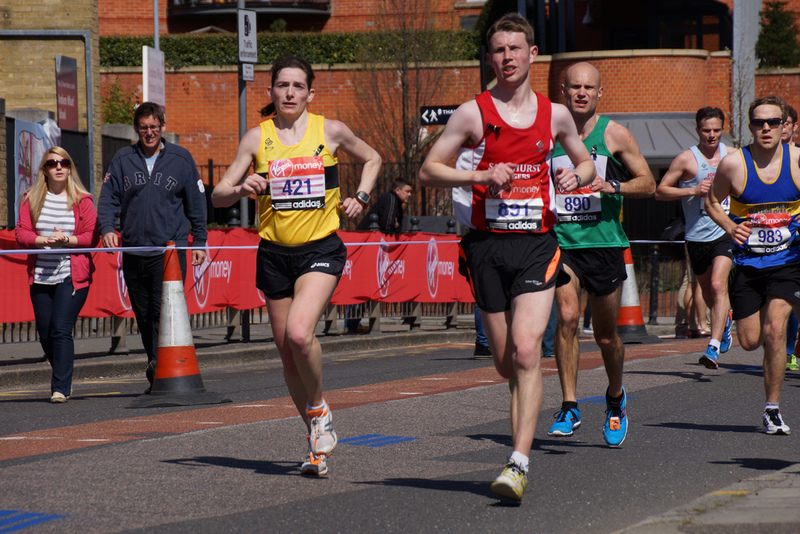 Robert Jerrett was first member home in 21:49 followed four seconds later by Matt Jones. The pacing practice was useful for all who experimented with some strategies more successful than others! Next weekend provides another opportunity to nail those paces. Over at Frimley Lodge ten members completed the towpath, woodland and park trails with Stuart Mayes first SJ into the finish funnel after 23:20. Sacha Kendall-Woods was next member home in 25:33. Eight members were in action at Parkrun Rushmoor with Stephen Casey running strongly to lead the SJs home in 21:42. Patrick Wadsworth completed the Country to Capital Ultra; a 70km run from Wendover in the Chilterns, picking up the Grand Union Canal and finishing near Paddington. Despite that Patrick will still be running on Monday night! Donning the colours of her University team; Kate Parker completed the first race of a weekend XC double at the Hampshire XC League which was actually held outside the county at Prospect Park, Reading. In Berkshire. Plenty of wildlife to be spotted for the two members who ran the Bushy Park 10k. Collette Callanan finished first in category, second female and eleventh overall is a flying time of 41:25. Stuart Overhill wasn’t far behind in twenty first overall with 43:19. Thursday: This week the threshold/improvers run will include the monthly group paced run and there will be pacers for seven, eight, nine and ten minute miling. Ellis Road is the route of choice this week. Meet at Sandhurst Sports Centre at 7:30pm and don’t forget lights and high vis clothing. The run is a great way to improve fitness by running as a group at a slightly harder intensity. There is a shorter route available which will also have a pacer and a sweeper so nobody gets left behind. Sunday: The next round of the Thames Valley Cross Country League is being held today by Tadley Runners at the Hurst Community College, Brimpton Road, Tadley, RG26 5NL. Claire will email the full details during the week.